Ugoos has finally announced the official release of Ugoos UT3+ TV Box based on Rockchip RK3288 quad core Cortex A19 processor with a much improved HDMI input function thanks to a Toshiba chip, and now supports DVR and PiP (Picture-in-picture) functions. Ugoos UT3+ runs Android 5.1.1, but there’s also a Linux firmware available to business customers. AS already mentioned the key feature here is HDMI input, and in previous products such as the first version of HPH NT-V6 or M-195 is was pretty much useless as all you could was display the HDMI input, not record it, or use PiP function. Last year products based on Mstar processor such as Zidoo X9 or Tronsmart Pavo M9 do a good job with HDMI input, but for example Kodi support was not ideal, at least at the time of the review. Rorkchip RK3288 is now a stable platform, and still powerful compared to existing TV box processor launched recently, so it should provide a decent experience combined with HDMI input features shown below. The first screenshot shows a Windows 10 PC connected to the HDMI input, overlaid by UT3+ overlay window to set recording options including recording path, resolution, video container format, and video length. 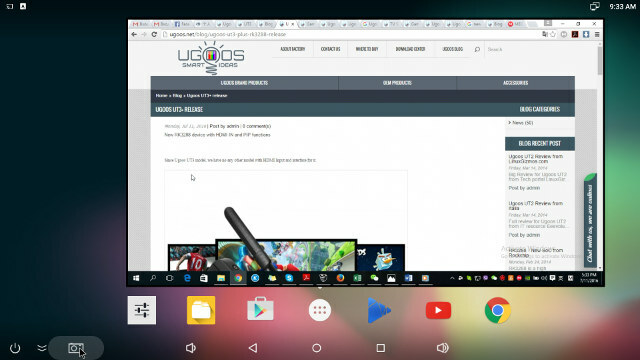 The second screen shows the same Windows 10 PC video input in a picture frame within Android. The picture frame can be resized, and moved around the display as you please. This seems basic, but it’s not a given in many PiP systems which only support fixed size, four positions (in 4 corners), and full screen. 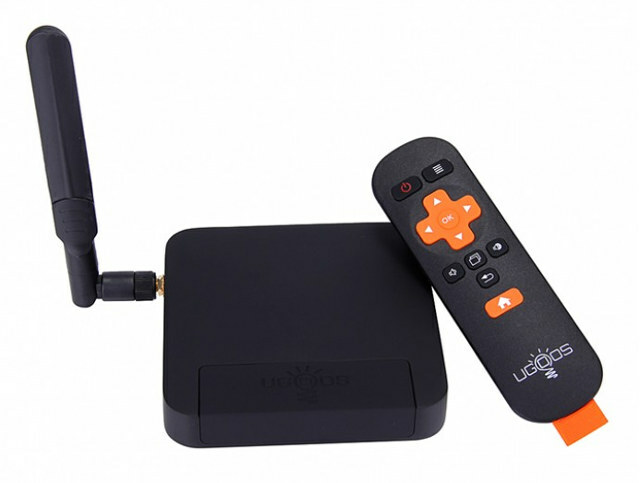 Ugoos UT3+ also benefits from recent improvement ported to other Ugoos TV boxes such as root enable/disable, NAS function (SAMBA), hardware monitor, gamepad settings, and Fireasy remote control app for smartphones. Please note that just like Ugoos UT3s, UT3+ comes with a fan, but you can adjust its behavior. The company has already release the firmware, which should also work on the older Ugoos UT3 minus the HDMI input function. While the product has been launched, there’s no purchase link yet, but people interested in the device can purchase a sample directly through Ugoos, for $95. 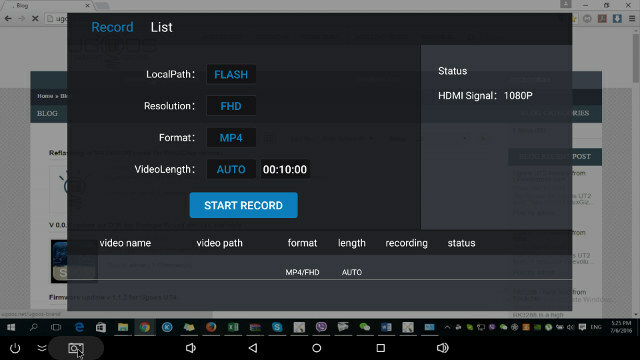 The recording interface seems very similar to Zidoo X9 or Tronsmart Pavo M9. I’m curious if it won’t be the same hardware in blue only with better software. Yes, the software is quite similar for the recording part, so it may have been the same software company handling that part. I’d wish recording to work in the background too. I looked on the sources of hdmi input app in firmware file and the hdmi input seems to be implemented as standard android camera but in a much much cleaner way than in Mstar devices. I’d like to have this device in my “lab” but it I’ll wait for more decent price. Moreover, it seems to support 3G/4G USB modems. @danman where did you get the source? Some companies regarded ZIDOO as a major competitor, copied appearance and software design from zidoo. Right.. I forgot about that, and under an Apache License. Originally the UT3+ produced many small files when recording via HDMI In. The latest firmware is much improved in this regard, it now produces a single file per recording. A 45 minute recording of [email protected] with 2-Channel audio produces a single file of ~2.4GB. The resulting recording is pretty good, more testing needed. There are two options available in the recording dialog box, both for the length of recording, 10 minutes, or Auto. HDMI In audio is two-channel and requires the sources volume not be too high, I have found that settings of source volume to be good at around 50%-80%, depending on source material. Too high a volume level results in digital distortion, so best to test before recording. PIP function works well and is improved over previous firmware. Size and location of PIP can be easily adjusted. HDCP did not pass on the first firmwares. I will check this soon. Otherwise, all of Ugoos’ special bits are in this 3.0.7 firmware. Linux should be forthcoming and it will support the HDMI PIP function. So far I like this box. Please check HDCP,without it,i am not interested for it. If one has HDCP keys, is it possible to add them in and have them work or is the code missing? will the linux firmware be available also to common customers? Any idea what is the max framerate it can record? Most likely 60 fps @ 1080p. But better wait for independent reviews. Here is a screenshot of a video recorded by the UT3+’s HDMI Input, being played in Ugoos Kodi. It is showing the maximum framerate. May be a stupid question but I’m looking for a device like NeTV or Skreens to overlay some notification or Home Automation over my TV Input. – Is there a good device for that ? – Can I do that with Ugoos UT3+ TV Box ? I assume I could set the PiP with TV Input and have somehow an Android browser in the back ? – Does it works with crypted HDMI Stream ? – May be there is a better device for that ? I guess you could use HDMI input full screen, and Android in a PiP window running a web browser to display whatever info you want. It’s not really overlay though. If that’s something that satisfied you, Ugoos UT3+ is an option, as well as Zidoo X9/Tronsmart Pavo M9 and the more recent Zidoo X9S. If it’s a commercial project, then you should be able to get in touch with either Ugoos or Zidoo for software customization and get a proper overlay implementation and API for your home automation system.